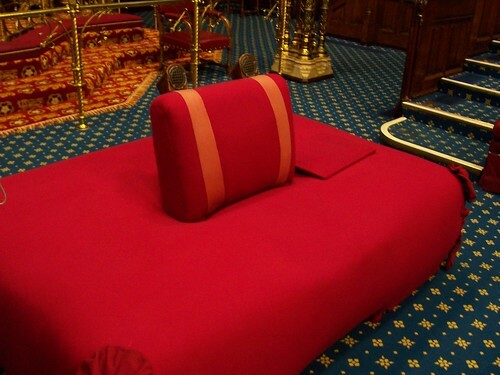 The Woolsack is the seat of the Lord Speaker in the House of Lords Chamber. The Woolsack is a large, wool-stuffed cushion or seat covered with red cloth. It was introduced by King Edward III (1327-77) and originally stuffed with English wool as a reminder of England's traditional source of wealth - the wool trade - and as a sign of prosperity. England's wool industry dates back over 2000 years and woollen cloth has been a prized export since Roman times. During the 12th century wool became England's greatest natural asset as a major source of revenue through exports of both woven cloth and raw wool. England's textile industry and the manufacturing of wool products grew during the 15th century, and significant developments in the industrial revolution were linked to the processing of wool. The Framework Knitting machine, invented in 1589, was the first major stage in the mechanisation of the textile industry. It wasn't until the 18th century that sheep breeding began to focus on meat rather than wool quality. Despite the rise of synthetic fabrics during the 20th century wool has remained an important and unique product. The General Assembly of the United Nations proclaimed 2009 to be the International Year of Natural Fibres. Wool is now being recognised as a uniquely versatile and sustainable product. The diversity of Britain's 60 and more different sheep breeds is a valuable resource in the 21st century world. The Worshipful Company of Woolmen has been in existance since before 1180 and is still an active Company today.